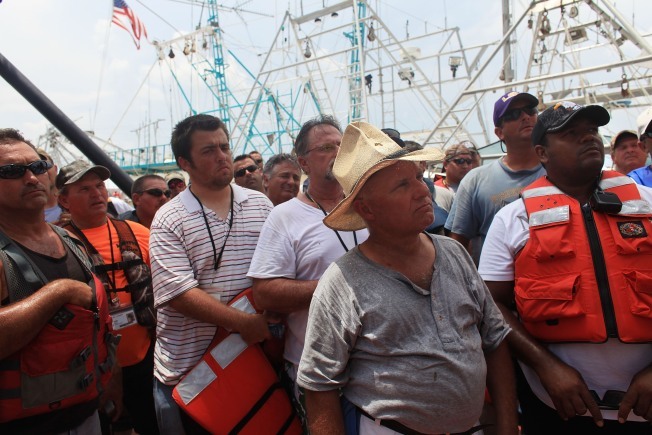 Workers, mainly fisherman, listen to Louisiana Governor Bobby Jindal speak with those involved in the clean-up effort of the BP oil spill on a command post boat in Barataria Bay on June 15, 2010 off of Grand Isle, Louisiana. Acting under heavy pressure from the Obama administration, BP Wednesday agreed to suspend its quarterly dividend immediately and establish a $20 billion escrow fund toward damages and claims arising from its disastrous Gulf oil spill. The move helps remove some of the uncertainty that has been hammering at the company's stock price since the April 20 accident, although it remains unclear what the total cost will be for the nation's worst oil spill. President Barack Obama, after meeting with top BP officials in the White House, stressed that the $20 billion was "not a cap" on BP's liability. Under the agreement, BP will set up an independently operated fund to cover the costs of cleaning up the spill and paying damages to individuals and businesses hurt by the disaster. The fund will be managed by Washington attorney Kenneth Feinberg, who has gained fame as the Treasury's "pay czar" after Wall Street's near meltdown in 2008 and as the overseer of payments to families of victims after the 9/11 terrorist attacks. BP also agreed to set aside $100 million to pay lost wages to oil rig workers idled by a temporary halt to new deep-sea oil drilling. Oil industry experts say it remains to be seen whether any amount of money can fully compensate victims and restore the Gulf Coast to conditions that prevailed before the massive spill. BP has deep financial resources to draw from. The company reported profits of $16.8 billion last year on revenue of nearly $250 billion. By suspending its $2.6 billion quarterly dividend, the company frees up additional cash flow for the escrow account, which will be funded gradually over the next several quarters. BP will pay $3 billion into the fund in the third quarter of this year and another $2 billion in the fourth quarter. That will be followed by quarterly payments of $1.25 billion until the full $20 billion has been paid. In New York trading the company's stock edged up slightly, although it has still lost about 50 percent of its value since the accident. Since the idea of a separate fund was first floated last week, numerous questions have been raised about whether the White House had the legal grounds to force a private company to set up such an account. BP has apparently agreed to do so voluntarily. BP was reportedly looking for a cap on the upper limit of what it would be obligated to pay, but Obama said no such assurance was given. More than 80 members of the House and Senate joined the White House in calling for the creation of the $20 billion fund. Estimates of the total cost of cleaning up the spill and paying damage claims have run as high as $70 billion. But until the flow of oil can be stopped, the final cost is unknowable. Some members of Congress from the affected Gulf states say they are more concerned about how decisions are being made about how the cleanup operation is being conducted than about setting aside funds to cover the costs. Critics of the operation say the White House hasn’t moved forcefully enough to take charge of the resources and equipment already being deployed. Company officials and government scientists are still unsure of just how much oil is flowing from the well, thought to be one of the ten biggest finds in the Gulf. On Tuesday, a team of U.S. scientists raised their high-end estimate by 50 percent to between 35,000 and 60,000 barrels per day. BP currently capturing rough 15,000 barrels a day from the runaway well. After 58 days, the expanding oil slick continues to threaten a growing portion of fragile ecosystems along the Gulf coast and jeopardize the livelihoods of tens of thousands of people in the region. Fishing and tourism alone bring in more than $120 billion a year into the region.